In film after film Blake Edwards explored the various ways in which human beings expose, mask, shape and shed their identities. This theme is the driving force behind The Party and it takes the film in unexpected directions. It also gives The Party its heart, which is represented by Peter Sellers’ portrayal of Hrundi V. Bakshi, a clumsy Indian actor who finds himself at a posh Hollywood party and proceeds to lose himself in the chaos that follows. When Edwards introduces us to Hrundi V. Bakshi he’s acting out a scene on the set of a movie that parodies George Stevens’ Gunga Din (1939). We quickly learn that Bakshi is an incompetent performer with a limited grasp of the English language and failing eyesight but he’s also incredibly likeable. When he accidentally wreaks havoc on the film set it’s impossible not to sympathize with him. Bakshi’s mishap might have been prevented if he wore his eyeglasses but he’s determined to try and be something that he’s not. His futile attempts to disguise his human flaws set the stage for Blake Edwards’ hilarious comedy that gently lashes out at Hollywood’s ongoing obsession with superficiality and artifice. 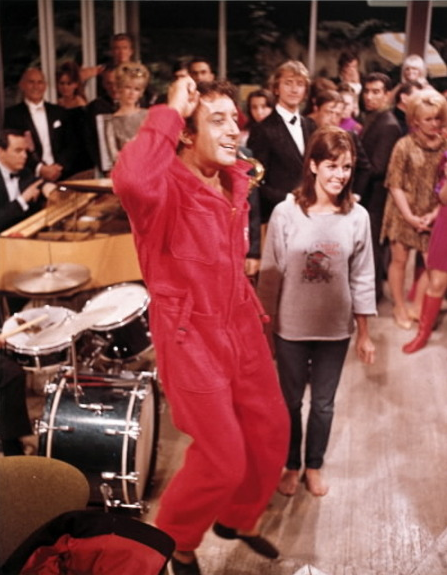 The Party is arguably Blake Edwards’ most experimental movie. For most of the film’s 99 minute running time there is very little dialogue. Edwards’ camera follows Hrundi V. Bakshi to a party in the Hollywood hills that he’s been mistakenly invited to. And we watch helplessly as he fumbles through a series of awkward social situations that are incredibly amusing and occasionally heartrending. The comedy is never cruel and most of the movie’s laughs are generated by our willingness to sympathize with Bakshi’s plight. In other words, you find yourself laughing with the character more than you’re laughing at him even when Bakshi is unable to laugh at himself. This is partially due to Blake Edwards’ affection for his flawed protagonist. Edwards uses Hrundi V. Bakshi as a filter and through him we experience the party as a microcosm of the wider world that he inhabits. As a Hollywood outsider Bakshi has no reputation to supersede him. The celebrities and studio bigwigs that he tries to mingle with find his Indian background strange, exotic and out of place. These glamorous guests lack empathy and their subtle displays of racism are especially jarring because Hrundi V. Bakshi is such as a charming and courteous character. When he finally sheds his skin at the end of the film after a long and treacherous search for an available bathroom, he emerges as a reborn man who was forced to undergo an unorthodox baptism by water after falling into a pool and nearly drowning. This final humiliation brings him in direct contact with a beautiful French woman (Claudine Longet) that he’s been exchanging glances and casual conversation with. Like Bakshi, she doesn’t exactly fit in and has been ostracized from Hollywood for rejecting the amorous advances of a lecherous film producer (Gavin MacLeod). These two unusual characters find kinship with a group of lively teenagers that crash the stuffy party and bring the radical and more generous spirit of the ‘60s with them. At the end of the film Edwards seems to be saying goodbye and good riddance to the “Golden Age of Hollywood” where racism and sexism were just par for the course. In his final act of rebellion Blake Edwards lets the awkward Indian actor get the beautiful French girl and the sweetness of their romantic encounter signals the start of a new decade for the director as well as his audience. The Party was shot on a set built at the MGM studio. Much like the fictional house that taunts Jacques Tati’s Monsieur Hulot in Mon Oncle (1958), the interior of the fabulous Hollywood mansion that hosts The Party was also an invention. Edwards and Sellers both admired Tati’s work and undoubtedly found inspiration in his portrayal of the fumbling Monsieur Hulot who is at odds with the modern world. But Sellers portrays Hrundi V. Bakshi as a man that wants to fit in. Instead of harboring disdain or a lack of interest in the present, Bakshi desperately wants to be at ease in his contemporary surroundings. Some of The Party’s biggest laughs occur when the innocent Bakshi is trying to maneuver around his new environment. His playful interaction with the house intercom system and attempts to put an end to a plumbing disaster seem to be tributes to the humorous spirit of Jacques Tati. But Sellers’ wide-eyed and innocent portrayal of Hrundi V. Bakshi suggest that the character is at home in the modern world depicted in The Party even if the modern world isn’t quite ready for him. In many ways The Party was collaboration between its director and star. Blake Edwards provided Peter Sellers with the outline of a story and a slim 63-page script to work with. Sellers was encouraged to improvise and he took advantage of Edwards’ generosity. By all accounts there was a lot of tension on the set, which seems at odds with the easygoing production photos snapped during filming. If there was a lot of tension you never notice it in the final product and that’s a testament to Edwards’ professionalism and directorial skill. It also seems strangely fitting for a film that attempts to unmask the hypocrisy hidden under the glitz and glamour of Hollywood’s polished veneer. Conflicts aside, together Edwards and Sellers were able to create one of the decade’s funniest and most socially conscious comedies. It’s also one of the directors most layered films. Many of movies best moments take place just out of sight or earshot. But the swirling mass of characters in The Party become more visible and audible from a distance. Behind closed doors and hidden in shadows their flaws and quirks are slowly unveiled but in the bright blinding light of The Party it’s easy to overlook them. You have to be willing to join the party if you want to enjoy the film. In simple terms, you can’t be a passive observer. You have to be an active participant. Thankfully Blake Edwards makes that easy. The director’s confident long takes bristle with life and it’s easy to imagine that you’re one of the party guests casually observing the ensuing pandemonium. The director and his star have often been criticized for using “brownface” in their representation of Hrundi V. Bakshi and it’s hard not to sympathize with the film’s critics. Sellers was an accomplished actor and talented mimic. He didn’t need to wear dark makeup in order to portray an Indian man. His brilliant vocal talents could have sufficed. Blake Edwards might have been able to persuade his star to play the part without makeup but by all indications neither of them thought much about it while they were making The Party together. It was 1967 after all and there was no maliciousness or ill intent in Sellers’ choice to use dark makeup in his portrayal of Hrundi V. Bakshi. The actor had spent a good deal of time in India during WW2 and his friendships with important Indian artists such as Ravi Shankar and figures like Swami Venkatesananda had given him a deep appreciation for the Indian people and their culture. I think it’s worth remembering that The Party opens by lampooning the classic Hollywood film Gunga Din, which featured the American actor Sam Jeffe in brownface and was widely criticized in India. In this context it’s easy to assume that the choice to use dark makeup was a conscious decision that reinforced the parody of Gunga Din. But Sellers was also visual comedian who relied on makeup, wigs, false mustaches, props and funny costumes. Makeup provided Sellers with a sort of shield that helped him identify with the characters he played on a more physical level. Sellers’ makeup also made it easy for Blake Edwards’ camera to single out his protagonist as an unwelcome guest. Sellers brownfaced character wouldn’t get lost in the sea of white faces that made up The Party and film audiences could immediately identify him as an outsider. When The Party was initially released it was a critical and commercial failure. The film undoubtedly offended a few Hollywood insiders too. Critics berated the movie for its slapstick approach to comedy and completely overlooked the films’ abundant style and timely social commentary. But Peter Sellers continually referred to The Party as one of his greatest achievements. That must have pleased Blake Edwards. The director and his star are so closely linked that their identities often overlap. Their stormy working relationship produced the hugely popular Pink Panther (1963) film and its many sequels, but The Party is their combined masterpiece. The complex character of Hrundi V. Bakshi seems to represent them both. Edwards and Sellers always saw themselves as misunderstood outsiders. They refused to define or identify themselves by Hollywood standards and in the process they experienced great personal successes as well as great failures. The Party hints at the rejection and disappointment that both men faced during their impressive careers. But it also celebrates their achievements.